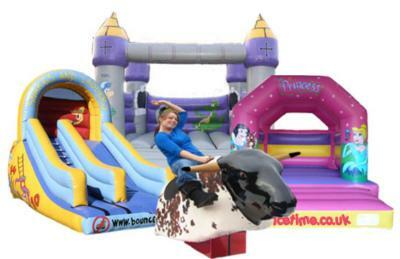 Bounce Time - Bouncy Castle Hire for Kettering, Corby, Wellingborough, Rushden, Raunds, Rothwell, Desborough, Market Harborough, Adult Castle, Slide, sumo wrestling, Rodeo Bull, Rodeo, Bucking Bronco, Bronco, Sumo, Crazy Games, Giant Garden Games, Northamptonshire. Our inflatables are ideal for kids parties, adult parties, Garden Party and a corporate or business event. Large and small events are catered for and we are fully insured. We offer cheap and discount prices in school holidays and for larger events. Or one of our other fantastic Items? If there are children or adults involved you can't go wrong with booking from one of the area's leading suppliers of Inflatable's & Giant Garden Games. Our range of equipment is ideal for all occasions from children's & Adult's parties, garden parties, birthdays, celebrations to family get together's & More! You simply don't need a reason to have a good time. Book your equipment today and get ready to have some fun. All of our castles are cleaned and checked for safe operation after every hire. that we will not let you down on that special occasion. No Cancellation fee charged for Bad Weather on the Day for outdoor hire's! No Cancellation fee charged for any reason with prior notice. You can be assured that we carry £5,000,000 public liability certification backed by a major insurer. Our Staff Are Fully CRB Checked. Our castles are RPii Safety Tested or PiPA Safety Tested & Tagged. The Only 2 Local Authority Approved & H&SE Safety Test Legally Required For Using Inflatable's at / on Schools, Local Authority & Council Land! Bounce Time is not only committed to the environment but is also Northamptonshire's Only Carbon Neutral Inflatable Hire Company! "Our business is obviously a lot closer to nature than most. So it makes both ethical and commercial sense for us to make sure that we do all we can to protect the environment that, after all, provides our livelihood. The sample pictures on this page are for illustration purposes only. All sizes listed are approx. All Bookings are taken as per our Terms. Actual pictures of our inflatables can be found on the Inflatables page. All image's text and content found on this website is (C) Bounce Time, anyone found violating our rights will be delbt with as per our terms! © Copyright 2006 - 2012 Bounce Time. All Rights Reserved. bounce time offers bouncy castle hire in Northamptonshire - Rothwell, Kettering, Corby, Desborough, Market Harborough, Burton Latimer, Irthlingborough, Wellingborough, Raunds, Rushden, Thrapston, Oundle, Brixworth, Lamport, Swyell, Northampton, Daventry, & Surrounding Areas, around northamptonshire, leicestershire, cambridgeshire, bedfordshire, . Call us with regard to hiring bouncy castles, rides, crazy games, slides, sumo wrestling, surfing simulator, rodeo bull, bungee runs, gladiators and other inflatables in kettering, corby, wellingborough, rushden, northampton, daventry. Our inflatables are ideal for kids parties, adult parties and a corporate or business garden party. Large and small events are catered for and we are fully insured. We offer cheap and discount prices in school holidays and for larger events.